Writing about science and existential risks. After the December 15 Republican debate, Donald Trump caught some flack for not seeming to know what the nuclear triad is. But how familiar are most people with what the nuclear triad involves? Did you know that we still have nuclear weapons on hair-trigger alert -- a relic of Cold War-era policy -- even though that probably increases the risk of nuclear war? And let's not even get started on self-assured destruction (that's right, self-assured, not mutually-assured). Or rather, let's do get started on it. One of the biggest reasons nuclear weapons are the threat they are today is because no one is talking about them. They've only merited a few minutes discussion at all of the primary debates combined, and few of the political candidates on either side of the aisle have taken much of a stance on them. Admittedly, North Korea and Iran have been in the news for their nuclear arsenals -- or lack thereof -- but how many Americans know much about their own country's arsenal? Before we can truly move to a safer society, we need to discuss and understand where we are now. Dr. David Wright, Co-Director of the Global Security Program for the Union of Concerned Scientists, sat down with me to discuss these issues and many more associated with the global nuclear threat. You can listen to the full podcast at the Future of Life Institute. Some people in the military today say that the risk of an accidental nuclear war starting because of a mistaken launch is greater than any other type of start to a nuclear war. But nuclear weapons have plenty of safeguards to prevent an accidental launch of a nuclear weapon, right? Not necessarily. The purpose of a hair-trigger alert is to quickly -- in a matter of minutes -- launch nuclear weapons if we detect an incoming strike from another country. In such an event, the safeguards would be overridden. If we get a false reading, which has happened many times throughout our nuclear history, those safety features may not help. Wright mentions one particular instance from the early 1980s, but the Union of Concerned Scientists has also recorded dozens of these events. But hair-trigger alert is necessary to prevent another country from launching a nuclear strike against us, right? Not really. The whole point of our nuclear triad is that we're fully prepared to strike back. 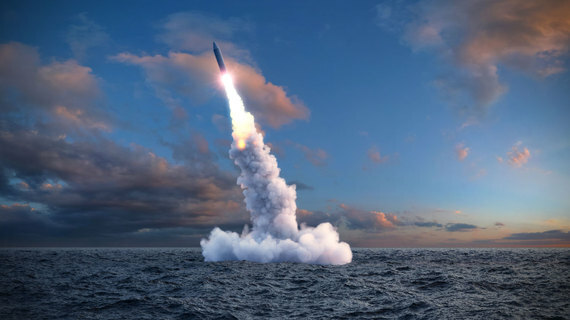 Even if our nuclear planes and silos were taken out in an attack, our nuclear submarines -- which are difficult to detect in the ocean -- would still be able to retaliate, which should ensure deterrence. Wright argues that "nuclear weapons should only be used to deter the use of nuclear weapons by another country, and if necessary, to respond to the use of nuclear weapons against you." This is known as sole purpose, which is contrary to the Obama administration's stance, which left open some options for using nuclear weapons as a response to other threats, such as chemical weapons or biological weapons. When a country uses nuclear weapons for anything besides deterrence, then specialized weapons become necessary for each potential threat. The result is a huge nuclear arsenal that really shouldn't be necessary and would hopefully never be used, yet costs tax payers tremendous amounts of money. A nuclear arsenal designed only to deter another nuclear attack would look much different and be significantly smaller. In fact, as Wright points out, the Joint Chiefs of Staff reported that we could cut our own nuclear arsenal from about 1500 to 1000 weapons, and we would still be just as safe. Instead, we're about to spend $1 trillion over the course of the next couple of decades to enhance our current nuclear weapons systems. As we get closer to the U.S. primary elections, it would be good for all of the candidates to go back to square one and have a real discussion about the goals of a nuclear arsenal and what the country's real concerns are. Said Wright, "If we're worried about terrorism, nuclear weapons are not going to help with terrorism, so let's take that off the table." He argued that the candidates really need to discuss "what is it we actually need or want nuclear weapons to do and what does that lead to." Most likely, that discussion would lead to a very different and significantly smaller nuclear weapons arsenal than the one we have now. Another important nuclear risk to consider is that of self-assured destruction, also known as the nuclear winter theory. Initially, the idea behind deterrence was that one country would avoid attacking another out of fear of retaliation. However, as nuclear winter became more well understood, scientists and world leaders realized that even if only one country launches an attack, without the risk of retaliation, its own citizens would still be at risk. That's because so much ash and soot and smoke and particles would block out the sun, sending global temperatures plummeting for many years. This would cause severe food shortages and mass starvation. Even a small nuclear war between India and Pakistan could lead to 1 billion deaths worldwide as a result of nuclear winter. Nuclear weapons are harder to deal with because they're somewhat invisible. A lot of people don't realize that since the end of the Cold War that there are still about 15,000 nuclear weapons in the world, that those weapons are typically much larger -- much, much larger -- than the weapons used in Hiroshima and Nagasaki. And so it's hard to get people to pay attention to this. It's hard to get political will to even start to grapple with this problem. Today, nuclear weapons are a liability. They don't address the key problems that we're facing, like terrorism and things like that, and by having large numbers of them around ... that you could have a very rapid cataclysm that people are, you know, reeling from forever. These are only a few of the highlights of the podcast, please listen to the full version here. And let's start talking about this!